Buy your Scuba Gear at the Official Divers-Supply.com, we have the Largest selection of Scuba Gear and have been serving the Scuba Diving Community since 1977. Our Trusted Brands are manufactured of the highest quality materials and with 40+ Years Of experience we offer the Best Prices on Scuba Gear. Have additional questions Call or chat with one of our operators or check out our Scuba Gear Blog to learn more , we are here to help and we are all Scuba Certified Divers here at Divers-Supply.com. Find All Your Scuba Gear In One Place!! If you are in the market for Scuba Gear, look no further! Not only does Divers-Supply.com bring you the best in scuba diving equipment, but we give great tips for the first time or experienced buyers. So, whether you are trying to decide which Sealife camera to buy or pick just the right scuba watch, Divers-Supply.com is here to help, if you have any questions, please don't hesitate to call us at 1-800-999-DIVE. Scuba diving equipment makes it possible for you to explore comfortably underwater for extended periods of time. That is, a mask doesn't see for you but allows you to see underwater. A diving regulator doesn't breathe for you but allows you to breathe underwater. A wetsuit doesn't make heat but allows a body to more effectively retain its own heat. Learn even more about Scuba Gear in our blog. The Gear You Need Depends on Where You Scuba Dive. Scuba BCD (Buoyancy Control Device)- holds your gear in place, lets you carry a tank with minimal effort, floats you at the surface and allows you to achieve neutral buoyancy at any depth. Look for one that fits snugly but doesn't squeeze you when inflated). Scuba Regulator and Octopus your regulator takes high pressure air from your scuba tank and adjusts it to the pressure you need for breathing. It supplies air only when you inhale (on demand), and directs your breath into the water when you exhale. It also routes air to your BCD, instruments and dry suit if you’re using one. Instruments ( gauges) tells you how much air remains in your tank so that you can end your dive well before you get too low. The SPG may be an independent gauge, or it may combine into a console with one or more additional instruments you use while scuba diving. It may also be integrated into your dive computer. Independent SPGs are analog gauges, whereas those integrated into computers are digital. Tanks a cylinder (more commonly called “scuba tank”) holds compressed breathing air that you use during the dive. Modern scuba tanks are made from aluminum alloy or steel alloy and are rated to hold pressures as high as 200 bar/3000 psi. Your dive regulator attaches to the cylinder valve. Scuba Mask the human eye cannot focus in water. The mask provides an air pocket so your eyes can focus and you can see clearly underwater. Your nose must be within the eye pocket so you can adjust for pressure changes. This is why swim goggles cannot be used for scuba diving. Look for Tempered glass - Plastic fogs up and standard glass is hazardous if accidentally broken. Desirable features (found in virtually all masks intended for scuba diving) Feathered, double skirt - Makes mask seal more reliable and comfortabl, Wide strap with touch buckle adjustment - Mask adjusts quickly, easily and stay adjusted during the dive and Low volume - The smaller the mask, the less drag it has while diving. Your face may require something a bit larger, so don't consider this an absolute. Fins provide a large surface area to push against the water. This allows you to swim using your powerful leg muscles. This moves you more efficiently and frees your hands. Snorkel lets you breathe at the surface with your face in the water without wasting air from your scuba unit. Scuba Gear Cost Less at Divers Supply. 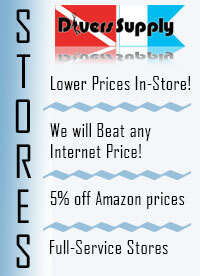 It's always easy to shop for Scuba Gear at Divers Supply. We have the best prices on Scuba Gear at Divers supply.